That’s No Moon, It’s a Barge! 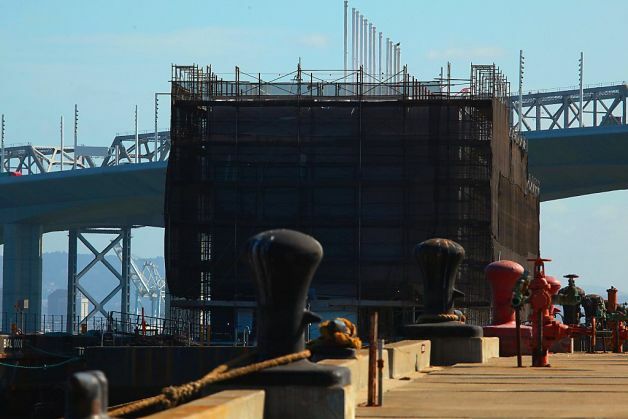 By now I’m sure you’ve seen it – a big ugly barge stationed in San Francisco’s bay just off of Treasure Island that is supposedly owned by Google (of Google search fame). It was originally surmised to be a floating data center, because what goes better together than servers and copious amounts of water? Since then it has been upgraded to being a Google Glass store, but at the very least we know it’s shrouded in the kind of secrecy that makes techie’s engines rev with the hunger of being the first one to find out. The barge, and another similar one in Portland, Maine, are not explicitly the secret property of Google. Both floating behemoths live in hangars leased by a company called, “By N Large,” which Pixar enthusiasts will recognize as the major corporation from the movie Wall-E. There is no information available online about this mysterious company, but CNET was able to link the company to Mountain View’s Google. So there you have it. All of these are equally likely to be true, so I plan on heading out there to urban explore the situation so expect some fuzzy iPhone pictures in the near future. Feel free to share your own theories below!